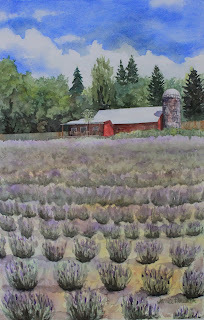 Janice H2O Color: L "Lavender Hill Farm"
Mike and Carol, friends of my sister, Ann, have a lavender farm near Lake Stevens, Washington. They have a gift shop that Ann helps out in during the season and they let her sell her crafts there in return. They host an annual Lavender Festival in the summer as well as a Harvest Festival in the fall, and a Holiday Festival in late November. Ann took this photo during the Lavender Festival 2 years ago. They invite lots of vendors, arrange entertainment, and all of their friends pitch in to direct traffic and run the event. Ann often takes pictures for them; one appeared in a local paper-unattributed, alas. I edited out the small tents and canopies from this shot and changed the orientation of her photo. I hope they like it! Janice, nicely done. I like the way the detail disappears as we are drawn farther into the picture plane. The red of the barn rivets our eyes on the center of interest. Your freehand floral painting is indeed very loose and very well rendered. Thanks for posting your Granada painting! That was a fun day.